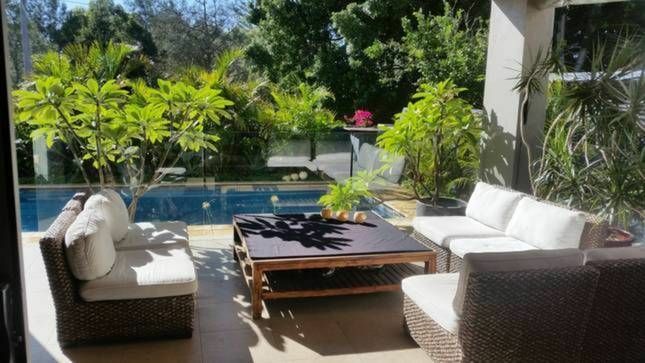 Enjoy this beautiful 5 Star Luxury spacious, private villa, with a view overlooking private pool and tropical gardens.140 square metres of living area plus pool and garden area. Great space any time of the year. Guests love the alfresco and pool area in the warmer months. Has a gas log fire where you can curl up in front of with a good book or a glass of wine in the winter months. Or you can enjoy watching one of the latest movies on netflix. There are two recliners at each end of the modular couch. The villa has a fully equipped kitchen and gas bbq on the covered alfresco area. Outdoor shower with hot and cold water, great place to shower after a early morning swim or surf or a jog around the park. Bathroom has large bath and large separate shower. Short stroll to local restaurants, cafes and bars and the beach. Across the road from parkland and playground. Two minute walk to public transport. Tea, coffee, milk , sugar and some spices. Balcony off main bedroom over looking pool and tropical gardens. Extra single bed can be made up in common area. The most amazing location, house, host iv ever stayed in and met! Tracey was lovely and let me know what Scarborough and Perth was like, showed me different things to do and was just an amazing host all round ! The house is a 11/10 and I’ll definitely be comeing back to stay and have a coffee with her in the city ! Such a safe house, would be a great getaway for even just a weekend if you live in Perth, feels like Indonesia. Thanks Tracey for an amazing stay !! Great location and walking distance to Scarborough. Very clean and new, felt like we were in a private villa in Bail. Highly recommended. We had a great stay at the Tropical Retreat. The weather wasn't the best, but the accommodation was perfect. Great location. The welcome pack was much appreciated. Our family lived close by and the alfresco area was perfect for entertaining. Thank you Tracey. Thoroughly enjoyed our stay. The outdoor entertaining area was wonderful as was the pool with a few humid and hot days in Perth. Bathroom was exceptional. Tracey our host was very welcoming and accomodating with wine and cheese on arrival - a real treat! Couldn't fault a thing, we loved the house and we will be back! Thank you Tracey! A gorgeous romantic getaway 15mins from home. Pool and outdoor area are amazing!! Digital tv and comfy lounge amazing! Beds and pillows are luxurious! Bathroom classy and spacious! Host very sweet with wine and cheese board waiting for us on arrival. Id recommend this accommodation not just for visitors to perth, but also to couples wanting a break from life without the drama of being too far from home.